Greetings friends and fellow crafters. LeeAnn here with my next project from Creative Vision Stamps. For this project I used Wilted Violet, Shaded Lilac and Black Soot Distress Oxide Inks and Seedless Preserves in Distress Ink to blend my background. 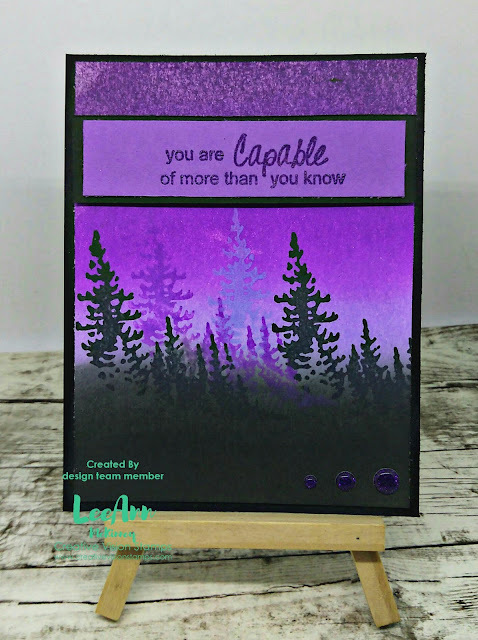 After it was dried I used the same three colors to stamp the Forest Silhouette Stamp multiple times in layering fashion to add depth and dimension. The sentiment is stamped in the Wilted Violet and heat embossed using clear embossing powder. Three purple glitter gems were added to the bottom to finish off my project. I hope you have enjoyed this project today. Please be sure to take a look over at Creative Vision Stamps and see all the other amazing Foilable products available, as well as the stamps in Clear and Red Rubber. If you like what I created today, you can shop www.creativevisionstamps.com and use my Design Team discount code to receive 10% off your next order of $20 or more. Enter my code: LEEANN10 at checkout. (It is valid on regular priced items only, doesn't count toward shipping and taxes, and cannot be used with their custom stamp service.). Summer Lovin with White Rose Crafts!! !